Rather than just simply stating that the production of ethanol for fuel is an unwise subsidy to special interests, Henry puts some perspective on the ethanol mania. Although corn is a renewable resource, it has a far lower energy yield relative to the energy used to produce it – what policy wonks call “net energy balance” – than either biodiesel (such as soybean oil) or ethanol from many other plants. 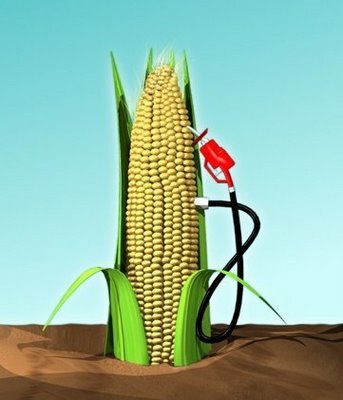 Moreover, ethanol production, particularly from corn, is a thirsty process, consuming roughly four gallons of water to produce each gallon of fuel. And when you count the water actually required to grow the corn, one gallon of ethanol “costs” a whopping 1,700 gallons of water. Finally, ethanol yields about 30% less energy per gallon than petrol, so mileage per gallon in internal combustion engines drops off significantly. And adding ethanol raises the price of blended fuel because it is more expensive to transport and handle. He also points out that lower-cost biomass ethanol would make more economic sense, but large volumes of ethanol from biomass will not be commercially viable for years (and production will be delayed by subsidies encouraging the corn-based verison). Although production of biomass ethanol is meager compared to corn-based ethanol, there are advantages to creating ethanol from biomass rather than corn. Cellulosic ethanol does not interfere with food production or require intensive agriculture. Raw materials—including not only wood, but grasses, yard trimmings, and even municipal waste—are abundant and cheap. As a renewable fuel source that is produced domestically and is carbon-neutral, biomass is an attractive alternative to fossil fuels. Yet economical production has proven elusive. In fact, commercialization has been “about five years away” for decades. Scientists continue to dispute the best technique for converting biomass to ethanol and, to date, there are no commercial-scale cellulosic ethanol refineries in operation. That doesn’t mean entrepreneurs aren’t experimenting. As Alison points out, Coskata—a renewable energy company—claims that it can produce cellulosic ethanol for less than $1 per gallon. Although this technology is still small-scale, and far from commercially available, it represents a possibility that the ethanol subsidy could be eliminated. Until that happens, the best place for cellulosic ethanol is a laboratory, not your gas tank. From 2007 to the end of 2009 I commissioned 12 ethanol plants for a combined total of nearly 1 billion gallons per year production capacity. All from corn using traditional dry milling technology. Not a single plant captured or sequestered the carbon dioxide released as a result of the fermentation process. Instead it was “scrubbed” to remove the odor and simply vented to the atmosphere. Where were the EPA regulations that should have prevented this? Well you see the industry catagory that the federal government can up with at the time for ethanol plants allowed them to skate under the radar on this. Imposing the need to capture carbon dioxide would have made it too expensive to build and operate these plants economically and profitably, even with subsidies. Additionally a big selling point for funding these plants was that DDG (dried distillers grain) which is what is left after fermentation of the corn mash, would supply cheap livestock feed and offset the increase in the price of corn for feed. WRONG ! at most 13% DDG can be mixed into feed or the result will be overly lean beef which is not desirable. George Bush pushed this boondoggle and we will be paying for a long time. Just ask the investors in VeraSun. I no longer work in the ethanol industry. Man Ron, you know your stuff. Good reading.